Wooden floor beams can be used as the basis of construction for interfloor and floor ceilings in wooden houses. Such structures must meet certain requirements in order to be sufficiently reliable and durable. Floor plan for the frame house. Wooden basement or attic flooring is a construction made of pavement or timber beams. They must be closed from two sides by some sheet material or board. The inner space of the ceiling must be filled with insulation to ensure the retention of heat inside the room. 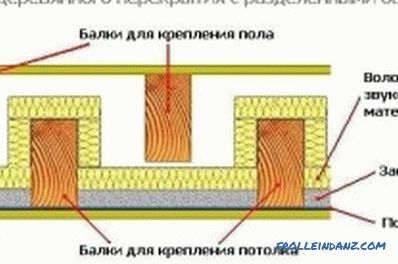 Of thermal insulation materials suitable mineral wool in rolls, expanded clay, mats, sand and clay mixture, sawdust (they must be impregnated to formulations that prevent fire), vegetable soil and so on. 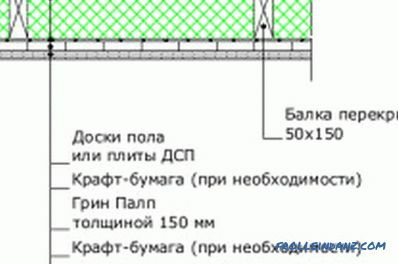 For the arrangement of rooms with high humidity it is necessary to provide a vapor barrier. For this, you can use polypropylene or polyethylene film. Various membranes that are capable of passing steam and moisture only in one direction will do. The vapor barrier is located on top of the insulation. High-quality films are needed to prevent moisture from entering the room. It must be ensured that the deflection of the beams of the wooden floor does not exceed the norm. To this end, in the design you need to place the beams at a certain distance from each other. In addition, beams must be perpendicular to the long side of the span. 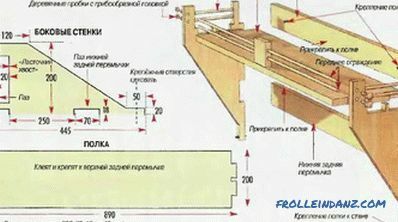 For example, if pine beams are installed, then for a span of 2x0.6 m, beams with a cross section of 7.5x10 cm must be placed, and for the manufacture of spans of 6x1 m, the necessary cross section of the beam is 17.5x25 cm. To install such floors, you can use plywood, boards, fiberboard, particleboard, OSB. These elements are stacked on beams. For their fixing, cranial rails nailed to beams or quarters carved directly into beams can be used. In some cases, it is possible to fasten the bottom casing directly to the base of the structure. In this case, these elements will serve as the ceiling of the lower floor and the draft floor of the upper or attic space. After lining, the lower part of the structure can serve as a basis for sound and heat insulation and at the same time a ceiling. 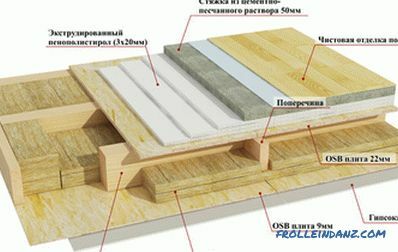 For laying the upper flooring on the structure, you can not use fasteners such as nails. However, in this case, the carrying capacity of the wooden floor will be weakened. The spacing between the overlap balls can be reduced depending on the flooring used. This primarily applies to those premises in which the flooring is subjected to dynamic loads, for example, created when people walk. 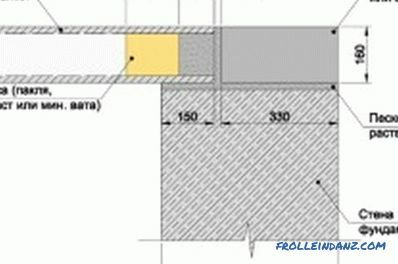 So, if a floorboard with a minimum thickness of 28 mm is used for the flooring, then the distance between the beam beams should be no more than 50 cm. Layout of the device basement. 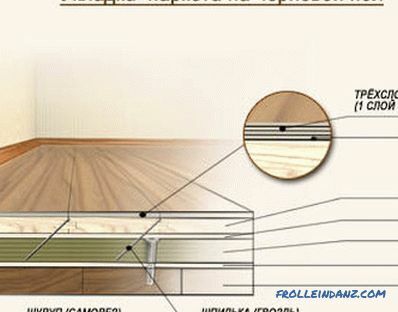 The design features of the wood flooring at the basement level, on which the floor is laid, are connected with the necessity of laying the subfloor. For the basement floor, so-called cranial beams are used. Draft floor is made of unedged boards, log runways or slabs. The cranial bars should be 4x4 or 5x5 cm in cross section. 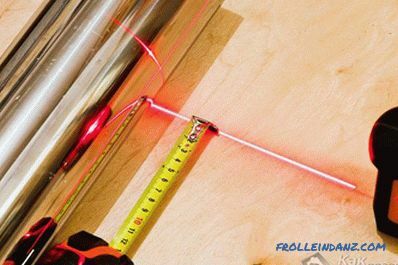 In addition, quarters can be cut directly in the floor beams to fix the flooring. Flooring elements can be laid tightly to each other without the use of fasteners. To prevent heat leaks, clay, slag, sand, sawdust, or mineral wool may be poured over the subfloor. The heat insulation layer must be protected on both sides with a vapor barrier film. The floor covering between the beams. The overlap device involves the manufacture of layers of sound and heat insulation. In residential premises, the floor temperature should not be lower than the air temperature by more than 2 degrees. To comply with this rule, you must use high-quality insulators. The modern construction market offers a wide range of watts that can be used as insulation. They are made on a mineral, slag or basalt basis. Such materials are available in the form of plates or rolls. Similar materials allow to obtain high-quality thermal and sound insulation. 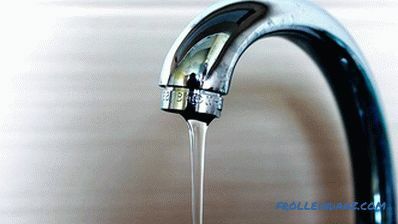 In addition, all modern materials of this kind have high sanitary and flame retardant performance. 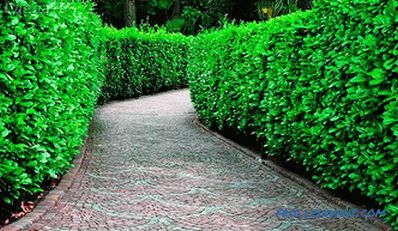 The harmful effects of moisture does not apply to them: they do not rot and mold. You can also use traditional thermal insulation methods.The most popular insulation of wooden buildings is still ruberoid. It is spread over the ceiling beams, and a layer of sand and clay mortar is applied on top. After complete drying of the solution from above, it will be necessary to pour slag or sawdust. To ensure effective thermal insulation in a region with winter temperatures of up to -20 ° C, a layer of slag of 14–16 cm will need to be filled. If sawdust is used, the thickness of their layer should be 5–6 cm. 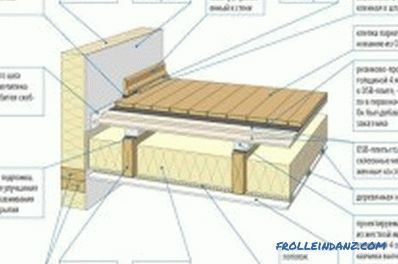 > The second way to create a traditional heat and sound insulation layer involves the laying of blocks made from a special solution. First of all, roofing felt is laid, and then blocks are laid on the mud. For the manufacture of blocks it is necessary to prepare a solution of cement, sawdust, clay and water in a volume ratio of 0. 3/1/4/4. The solution is poured into pre-prepared cells from the boards. The optimal cell size is 40x60 cm. The solution should be dried in the shade. A very important point, which must necessarily be foreseen, is the presence of air space in the construction of the flooring made of wood between the finished floor and the heat-insulating layer. The minimum height of this gap should be 2 cm. Air should circulate freely in this free space. If effective ventilation of the floor is not ensured, the wooden beams and the reverse surface of the finished floor will rot and cause mold. In addition, it is imperative that before the creation of any wooden structures, the wood and other wooden elements are treated with an antiseptic. Thus, the design of wooden floors has its own characteristics, which depend on the position of the floor in the overall structure of the building. For basements and ceilings there are certain rules of the device. When creating any of these structures, it is necessary to provide heat and sound insulation. In order for a wooden floor in a private house to serve for many years, certain laying rules must be followed. Better yet, make it multi-layered. This will improve the heat and sound insulation.